Being Monday it was over to Addenbrooke’s for a physio session. The only painful thing about today was finding a parking space. We drove round 4 times and all the disabled bays were full so we headed to the multistory car park. We managed to get a disabled space there but had to pay, and pay we did! My physio session is 2 hours and of course anything over 2 hours the price goes up so we paid a staggering £6.50, bloody daylight robbery! Moving onto the physio itself and I had a great session. Did a warm up with the exercise band and moved up the resistance a notch from a red to black band. Next was the bridging exercise on the gym ball and after 15 of those some dumbbells were introduced to the exercise. Instead of me bridging with my hands across my chest I had to push the dumbbells up, then bridge (with the dumbbells still being held up) for 5 seconds, release the bridge and finally lower the dumbbells. The biggest challenge for me with that exercise was staying on the ball. The rowing machine was my next bit of equipment which was great, I did 2 mins then a short break, another 2 mins and a break and lastly another 2 mins. Now that may not sound very much but for someone who has not been able to exercise for years a slow approach works best, I still have the other leg to look after too. The parallel bars was the next, nothing exciting just standing and balancing on my leg. After a while I was given a ball which I had to raise above my head and then lower while still balancing on my leg which I did quite well with. The last part of the session was a bit exciting and daunting at the same time because out came a leg. 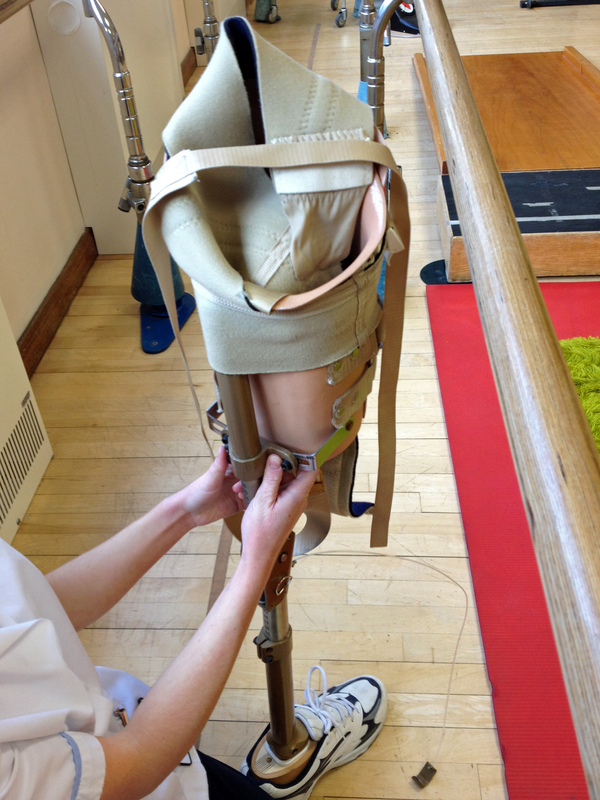 Libby my physiotherapist took some measurements from my good leg and then made adjustments to the artificial one. This was being made up to fit me and every time I go for physio I will use the same leg, this will cut down on the alteration every week so I can just crack on with the work. I didn’t get long with it this week but I did manage to take a couple of steps and turn around with it on. It felt extremely strange and very heavy. I will be using a belt next week instead of a strap that went over my shoulder which will apparently make the leg more secure. All in all I felt I had an excellent session today and feel I am progressing well with things. Tomorrow I will see Dr Kirker the Rehabilitation Consultant so I’m very interested to see what comes from that meeting.